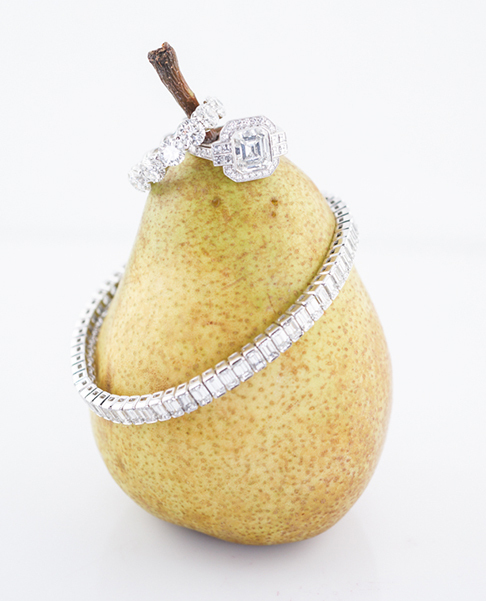 Filigree is thrilled to be a part of your happiest moment. We met online… Match.com. Traded only a handful of messages before meeting up for brunch at the Hi Lo diner in my neighborhood. A very sunny and pleasant morning turned into a long stroll along the Mississippi River Gorge. Fortunately Annie brought her hiking shoes! …actually she jokes about that because she was wearing dress flats. Still she proceeded to trudge over rocks and hills without a care. why did you choose filigree ? I appreciated the quality, selection, and service. Annie led me to the ring she wanted. However, we are both very happy with the service. So much so that I returned to buy her additional jewelry. How did you propose ? I knew I wanted to marry her within a few months of meeting. However, I waited for the opportune moment. She had told me of a particular ring she liked (on Filigree’s Etsy page). It was simple and elegant (much like Annie), and very different from what her friend was interested in. She showed these to me as a comparison very briefly one day. I took note and went to buy it shortly thereafter. After I secured the hardware, I waited for the opportune moment. Travel is important to both of us, so i knew I wanted to pop the question in a location that would be meaningful for both of us. I decided upon the Skagit Valley Tulip Festival in Washington State (https://www.tulipfestival.org/). Tulips are one of her favorite flowers, and she had told me about her travels to Holland while studying in Belgium. The Pacific NW is a favorite place of mine, and I could imagine getting down on one knew in a field ablaze with color. We met at the Downtown Minneapolis YMCA. We had seen each other in passing a number of times, but we formally met when he asked me to race him up the stairs at a bootcamp class. Of course, I agreed, and that’s when we hit it off. We then began attending yoga and bootcamp classes together, and eventually started teaching our own classes as a team. We stumbled upon Filigree online while searching for unique and vintage wedding bands. Once we visited the shop, we knew it was the perfect place to purchase our wedding bands. 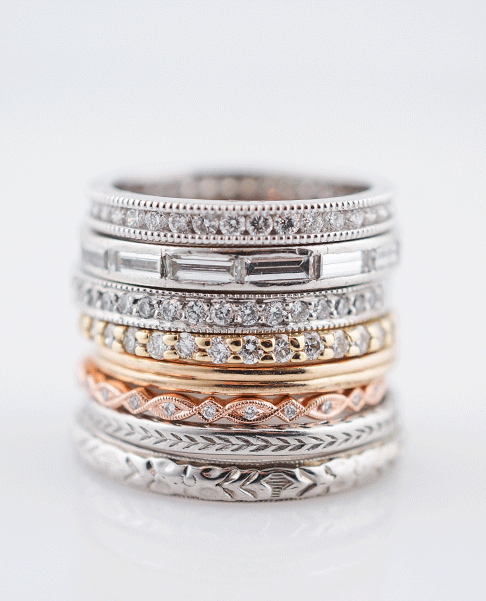 The staff helped us create a beautiful stack for me and the perfect band for Max. I always love telling people the history of each of the rings in my stack. Well, little did I know he was about to propose me right then and there eating philly cheese steaks in our gym clothes. It was perfect and low key, which was right on par with our laid-back style. All of you were mentioned in the credits. Thanks for all you did to help make our day special. Hard to believe we are looking at the 2-year anniversary this summer. We were introduced through two of our best friends who were dating at the time, and also graduated from the same high school as I. Little did we know we actually met previously during high school since Miranda went to a homecoming dance with a friend of mine. After Miranda and our friends sifted through past yearbooks she decided to take the initiative and reach out via Facebook re-introducing herself and saying we should know each other if our friends are together. I waited probably 30 seconds after receiving that message before I reached back out, set up our first date, and the rest was history. We had actually been looking at engagement rings together for a few months but nothing stood out. We thought making something custom was going to be the way to go, however we never saw anything that truly looked unique and different to us that we could pull inspiration from. During this process Miranda came across the Little Black Room within MP3 with her mother and sister while shopping for my birthday. Since the pop-up was new to us (we were living in Chicago at the time and hadn’t been back for a while) Miranda and her family wandered in and immediately spotted her ring. It was different, incredibly unique, she had just never seen anything like it (and the photos can prove that). Sharon helped answer all her questions through the process, made the whole experience much less intimidating, and I got a phone call about 30 minutes later saying she found the ring. Without her knowing I worked with Sharon and purchased the ring 2 weeks later. Awkwardly… My parents had just moved into their new space and I had disguised a trip from Chicago back to Minnesota as a “house warming” that we needed to attend. From there I had her family and my family (without them knowing the proposal was happening) come together to celebrate my parents new home while we began the 7 hour drive back with our dogs. During those 7 hours I rehearsed what I was going to say in my head just about the entire trip. Once we arrived, I walked around the car, opened the door for Miranda, and instantly forgot everything I was going to say. It was about 3 minutes of blacked out mumbling with random tangents and awkwardness. During that Miranda quickly picked up on what was happening and began to look around to see if the family was watching, which meant I had to bring her attention back to my awkward attempt instead of looking around. As I got down on one knee and asked her I was greeted by an “I KNEW IT!” before even saying yes as I put the ring on her finger. After that moment we were able to walk into a room full of family and completely surprise them. End of the day it was very us and pretty great to see we could still get butterflies around each other even after years of being together. we are an actual online dating success story. mike had taken a break from online dating and i was about to when i decided to respond to this guy who had messaged me a couple of months ago. (he had a soul patch in his profile picture, what was i to think?) we had a pleasant first date at Psycho Suzies where i was sick with the plague and mike survived. One date led to more, and before i knew it I had my perfect partner. We both have a love for the classics and things that have stood the test of time. When house shopping we knew we wanted an older house and at 112 years old, it fit the bill. When it came time to shop for our wedding rings, I knew i wanted something with a history that we could add to in our own way. I met Catherine and Brent a few years before when doing some birthday shopping for myself. Catherine knew before I did that I would be buying my wedding ring from them. We were married at Culzean Castle in Scotland, UK. An 18th century castle and the antique rings were a perfect accompaniment to so much history. After living in our house together for 7 months we spent a day moving my office to the newly renovated home office. This included bringing all the office equipment up 3 flights of stairs and multiple trips between NE and south minneapolis. To celebrate we walked to the pub down the street for beers and burgers and on returning home we got into comfy clothes for some chill time. When standing in the kitchen Mike wouldn’t take his hand out of his pocket and was acting strange. I kept asking what was going on and finally he pulled out a ring he had made out of a two pence coin from our last trip to London and asked me to marry him. I didn’t think it was real at first and then made him get down on a knee 🙂 I said yes, we popped some bubbly and the rest was perfect. I did give him grief for proposing to me while i was wearing yoga pants and lemurs on my socks…they are now affectionately known as my “engagement socks”. Several years ago, we first met through mutual friends, one of Kasey’s best friends in particular. Not many months later, we were both encouraged and somewhat “pushed” towards one another. Kasey visited Rochester to watch the production of “Grease” with some friends. I was part of the cast in that show and afterwards, Kasey and her friends celebrated the show with members of the cast. Even though we were seated right across the table from one another, we were both too shy to say much to the cute boy/girl across the table. Only a few weeks later, Kasey revisited Rochester again, and this time we connected. As my wife loves to remind me, it was her that asked me out on the first date a few days later! I knew that Kasey had an affinity for vintage style and design, and wanted something unique but classic. I went to a few of the typical jewelry stores in the metro that you always hear on the radio, but whenever I would inquire about vintage style engagement rings, they typically brought out their version of “vintage.” This was usually a ring that had some small etchings or little designs but seemed very unauthentic to me. Nothing grabbed my attention and I wanted to make sure I had the perfect ring. I mentioned my frustration to a friend from the gym, Zach Kopp, who had just had a wonderful experience with Catherine and Brent as he purchased an anniversary gift for his wife, and suggested I check out Filigree. As soon as I walked in, I knew I had found the right spot. Brent and Catherine were so incredibly helpful. 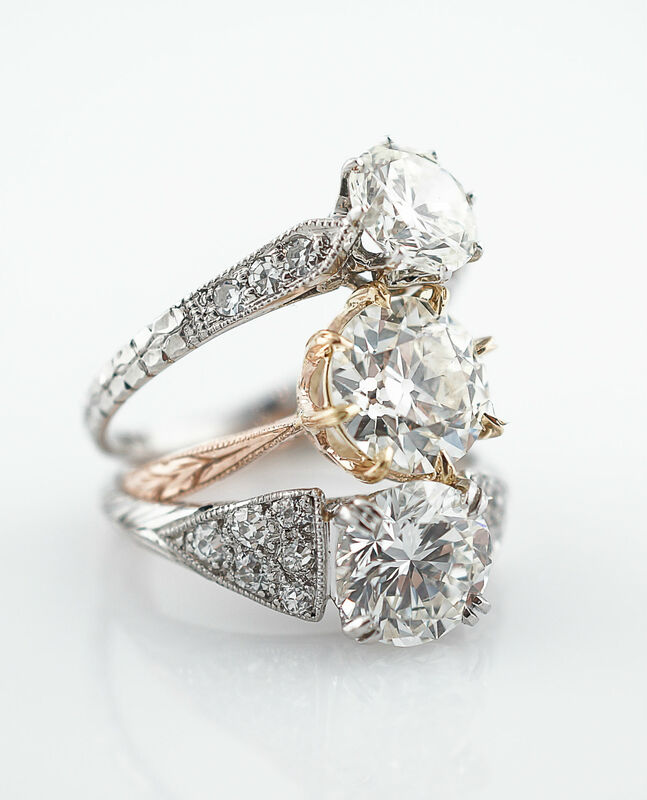 They had the knowledge to help me make my choice while also tailoring to the vision and requirements I had for the perfect engagement ring. Kasey loved the vintage yellow-gold ring I found, and we were so impressed with Filigree it was a no-brainer to come back for our wedding bands and my wedding gift for her. I cannot express to you how in love I am with my ring that you helped Joe to create. I look at it multiple times a day and it is the perfect ring. We spent a fair amount of time looking at stores in the Twin Cities, and nothing I tried on felt quite right. Little did I know Joe had a plan to design one for me, and I am so glad he chose you for the project! I have had multiple people – friends and people I don’t even know – say things like “I love your ring! It is so unique and timeless!” Thank you so very much. You have a very special place in my heart. They say the best form of a compliment is a referral. We are looking for reviews from our clients on our YELP page and would love it if you could contribute. Please feel free to share your experience working with us so that new clients looking for feedback can feel as confident in us as you do. We are so excited for all of our our clients! Contact us and find out how to feature your story!